Like a lovely floral hug, this blushing bouquet delivers your sincerest condolences in a way that is sure to comfort the pain of loss. 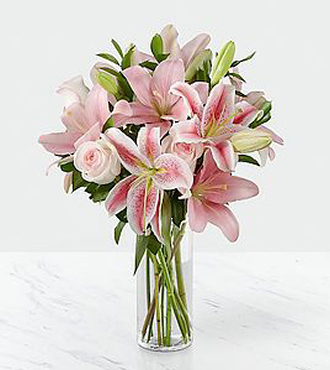 Simple and beautiful, this composition handcrafted by an FTD artisan florist of pink roses and pink Asiatic lilies enhanced with lush greens is arranged in a clear glass cylinder vase. It makes an excellent choice for expressing your sympathy at a wake, for the funeral service or to console family and friends at home. You save over $6 at FlowersFast! (Compare to FTD retail price: $70 + $22.98 for same-day delivery.) You get the same quality, at a lower price! No extra charge for same-day delivery. FREE personalized gift message included. (Extra delivery charge for Alaska and Hawaii) Same-day florist delivery is available for this item, for orders placed before Noon in the recipient's timezone. Please see the Ordering and Delivery Information.